In two plays, Eric Dawson covered 65 yards on Saturday night at the C.M. Russell High football scrimmage at Memorial Stadium. He had a 30-yard catch and followed it with a 35-yard touchdown run. Head coach Jack Johnson said he was pleased to have Dawson back as an offensive weapon. The 6-foot-1, 200-pound do-it-all junior missed much of last season with an injury. 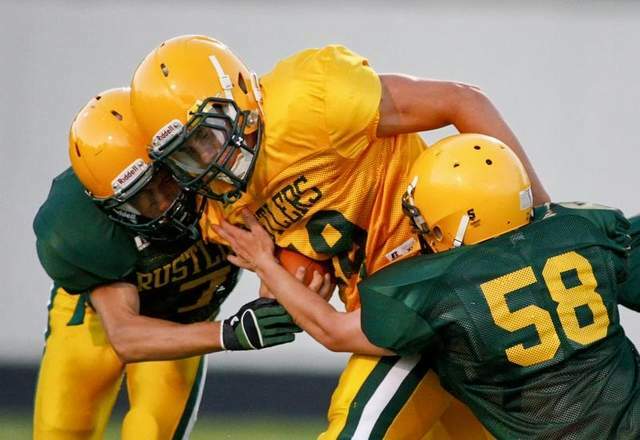 Dawson was one of many bright spots for the Rustlers, who ran a disciplined and spirited scrum. On the second play of the night for the varsity offense, senior rusher Hunter Thomsen (5-11, 180) burst through the line of scrimmage and had a clear path to the end zone, but the referees blew the play dead. The refs were quick to the whistle Saturday to avoid injury, Johnson said. Thomsen went on to punch in a score from the 9-yard line later in the night. Junior quarterback Jayse McLean carved the second-string defense for a trio of impressive touchdown passes, including a 25-yard strike to Daekwon Carter, a lob to Jimmy Grinde and a short pass to Dawson. McLean also tucked the ball and ran a handful of times. Linebackers Will Smith, a senior, and Jakob Jackson, a junior, made several plays on the defensive end. Smith racked up a couple would-be quarterback sacks and Jackson made an acrobatic pass deflection. The Rustlers open the season next Friday on the road against Butte. Like Trib Sports on Facebook!